Hundreds of Brazilian police officers backed by armoured cars and helicopters have moved to take control of two Rio de Janeiro slums notorious for drugs. 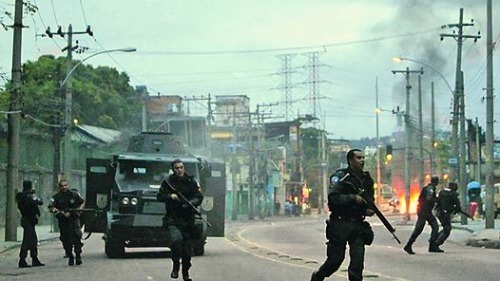 Some 1,500 police and commandos took part in the operation in the northern favelas of Jacarezinho and Manguinhos, which began at 05:00 (08:00 GMT). The no-go areas are known as centres for the trafficking of crack cocaine. Brazil has been trying to clean up its most dangerous regions ahead of the 2014 World Cup and 2016 Olympics. The raids are part of a policy known as “pacification” which was adopted in recent years to help the state establish a more permanent presence in shanty towns. The drug gangs’ gunmen apparently retreated ahead of the operation and there appeared to be little resistance. Brazil is the world’s largest consumer of crack cocaine, and the second largest consumer of cocaine and derivative drugs after the US, according to a study released last month by the Sao Paulo Federal University. The report further states that operations have involved up to 2,000 police and military personnel that have included soldiers from the Brazilian navy, and included use of armored vehicles and helicopters. Many residents have been in a state of fear as many of their houses have been entered and searched by these armed men. Over 20 of Rio’s nearly 1,000 favelas have reportedly been “pacified” so far. Pacification is an attempt to gain more state control over these areas where before the only governance was done by armed criminal organizations. But the police, corrupt and brutal, are often no better than the drug traffickers. And the Brazilian state has only recently shown an interest in these areas to clean up for these upcoming games for the benefit of tourists who will be arriving for these events. Informed observers have long pointed out the repression by cities and nations that precedes their hosting of the Olympics. The cities that host them become virtual police states during the hosting time. Movement is monitored and poor peoples are relocated and restricted. Brazil will be no different. Also Brazil is wrought with many contradictions. Brazil, although considered a Third World country is one that is wealthy on a comparative scale. It is becoming a major force in the global economy. While it increases its presence in the global economy and a few become wealthy, the majority of the people will remain in poverty, popular movements will be repressed, and inequality will continue. Brazil has elected progressive parties in the past,but none of them have broken from the reins of capitalist-imperialism. Only the people of Brazil will do this in the end. The favelas of Brazil are a glowing example of the situations the masses of the world find themselves in. Today 1 out of every 5 persons in Rio de Janeiro lives in a favela. Increasingly around the world the global poor is concentrated in cities. Mike Davis wrote about this phenomenon in his book “Planet of Slums.” Now over half the population of the world lives in cities, in contrast to the countryside. As the World Cup and Olympics approach, more repression such as this will continue. This along with several different struggles that popular movements inside Brazil continually wage every day to achieve justice. In the end the people of Brazil, as will the masses of the rest of the world, will win and bring about a new world that is one of justice and equality. Next Post Review (Part 1 of 3): Paul Baran, “Some Theoretical Implications”: Monthly Review, Vol. 64, No. 3. July-August 2012.